Founded in Toronto’s Yorkville district in 2001, The Dragon Academy is a socratic, museum-based, integrated school revered for valuing rich, challenging and unusual content in its curriculum via lively connections with Toronto’s key cultural institutions. This made it the ideal local sponsor for the equally inspired new form of storytelling featured in the pending, locally created & produced web series, Ruby Skye P.I. The Dragon Academy is heavily featured as a principle location for the series’ action: it is just the sort of school environment to promote the curious, inquisitive and often hilarious sleuthing adventures of the quick-witted, impulsive mystery devotee, sixteen-year old Ruby Skye — a very young would-be detective bent on getting to the bottom of a mysterious email scam which has defrauded a well-meaning but eccentrically naive neighbour. Ruby Skye P.I. is a tween web mystery aimed at kids ages 8 through 14 and is one element of an impressive cross-platform project intended to entertain, engage and educate kids online around the world. Ruby Skye P.I. is the brain-child of Canada’s pioneering transmedia creator, Story2.OH’s Jill Golick (Hailey Hacks, Crushing It, BoyMeetsGrrl) and already represents a dazzling collaboration among community, corporate, and creative partners — all keen to see Canada reach the cutting edge of excellent online content for young people. The first Ruby Skye P.I. mystery began principal photography at The Dragon Academy and on location around Toronto on August 16th and continues shooting its first mystery, The Spam Scam until September 2nd. Ruby Skye P.I. is one of nine digital web series projects selected for investment by the highly-competitive Canadian Independent Production Fund’s new web series program. Ruby Skye P.I. continues to seek local, national and international partners to fully realize its exciting vision. Interested potential sponsors can contact creator Jill Golick at 416.414.8539. We’re back after a break over the BC Day long weekend and trying to get back into the swing of things. News out of Toronto this morning is that Virgin Gaming has partnered with Ubisoft to be the online tournament provider for some of the publisher’s most anticipated multiplayer console releases. Leading the charge is Tom Clancy”s Ghost Recon: Future Soldier™, the latest chapter in the award-winning franchise. “Ubisoft is thrilled to be partnering with Virgin Gaming on its new venture. We have an exciting lineup of multiplayer titles this year that we believe will be a perfect fit for gamers to play and compete against each other in a tournament setting,” said Laurent Detoc, president of Ubisoft North America. 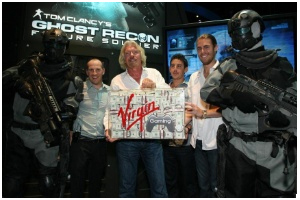 Sir Richard Branson unveiled Virgin Gaming to an enthusiastic reception at this year’s Electronic Entertainment Expo (E3). The overwhelmingly positive response helped Virgin Gaming to quickly take the industry by storm, being the first online platform for gamers of all skill levels to compete in some of the best games for the biggest prizes. In true Virgin style, Branson kicked things off with dramatic flair, announcing that Virgin Gaming would give away over $1 million in cash and prizes over its first 12 months. Ubisoft headlines a slate of industry partnerships with key publishers and retailers to be announced by Virgin Gaming in the coming months. Additional details on these partnerships will be announced soon. nextMEDIA has just opened up for 2010 Design Exchange early-bird registration. The conference, which will be held in Toronto this November 29th and 30th, will help you create opportunities for your business by bringing together the highest growth areas of the converging next-generation entertainment marketplace. * 2 days of learning, strategizing and collaborating across all areas of digital entertainment, including advertising, gaming, TV, mobile, music and publishing. * Facilitated meetings and networking between established industry leaders and emerging new talent from multiple sectors. * Sessions, discussions and workshops designed to drive your business forward and provide you with the connections and info you need to stay ahead of your competition. * Insight into emerging technologies and platforms that can change your business. Don’t forget that Digital Leisure’s Match Up!, designed exclusively for Nintendo’s DSiWare™ game service is available as of today for only 200 Nintendo points.